contains no chemical harmful substances. 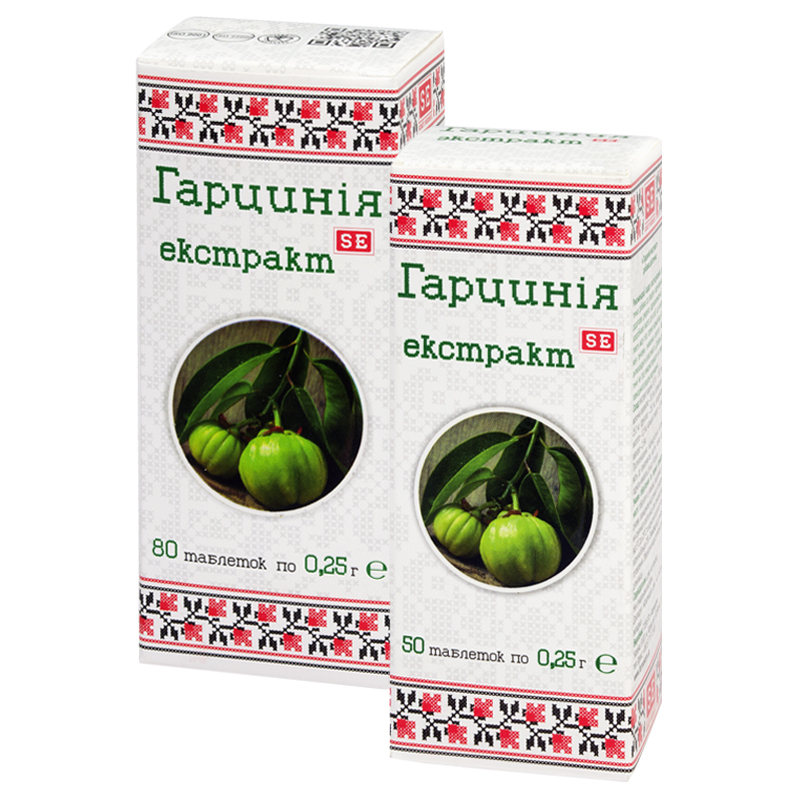 Garcinia Extract 50% – 150.0 mg, ascorbic acid – 12.5 mg, excipients. Garcinia Cambogia extract contains hydroxycitric acid (HCA), which is rarely found in other plants and which main effect is aimed at reduction of hunger and weight loss. HCA blocks enzyme, contributing to cholesterol and fatty acids synthesis, intensifies process of fats decomposition (lipolysis), improves metabolism, raises body energetic balance. HCA helps supporting normal blood glucose level and prevents feeling of hunger. By suppressing acetyl coenzyme A synthesis, hydroxycitric acid restricts further synthesis of fatty acids, activates oxidation of fats and carbohydrates in the liver and tissues, thus preventing their further deposition. Bromelain is a proteolytic plant enzyme, extracted from pineapple plant stems, fruit and leaves. Bromelain breaks down proteins into amino-acids, activates numerous defensive processes, occurring with participation of numerous regulative systems of the body. In addition to proteolytic action, bromelain has anti-inflammatory, immunomodulating effects, helps eliminating metabolic products and toxic substances, excess fluid from the body, accelerates tissues regeneration processes, has positive effect on the cardiovascular system: improves blood rheological properties, prevents blood clots formation. Ascorbic acid (vitamin C) is an active participant of oxidation-reduction processes regulation in the body; it regulates carbohydrate metabolism, has expressed antioxidant properties. Adults take 1-2 tablets thrice a day with food. Wash down with sufficient amount of water. Term of use is up to one month, further the term of use and the possibility of retreatment are to be agreed with a doctor. Individual sensitivity to certain components, pregnant and lactating women, children under 14. Proteins – 0.5 g, carbohydrates – 21.41 g, fats – 0.23 g.